Felis irbis ଖ୍ରୀଷ୍ଟିୟାନ୍ ଏହରେନବର୍ଗ୍, ୧୮୩୦ (= Felis uncia ସ୍ଖ୍ରେବର୍, ୧୭୭୫) ଓ ଏହାର ପରବର୍ତ୍ତୀ ସମୟର ଜୀବବିଜ୍ଞାନ ନାମ (ଥିଓଡୋର୍ ଶେର୍ମାନ୍ ପାଲ୍ମାର୍, ୧୯୦୪). ↑ ୨.୦ ୨.୧ Wozencraft, W.C. (2005). "Order Carnivora". In Wilson, D.E. ; Reeder, D.M. Mammal Species of the World: A Taxonomic and Geographic Reference (3rd ed.). Johns Hopkins University Press. p. 548. ISBN 978-0-8018-8221-0. OCLC 62265494. ↑ ୩.୦ ୩.୧ Nyhus, P.; McCarthy, T.; Mallon, D. (2016). Snow Leopards. Biodiversity of the World: Conservation from Genes to Landscapes. London, Oxford, Boston, New York, San Diego: Academic Press. ↑ ୪.୦ ୪.୧ McCarthy, T. M.; Chapron, G., eds. (2003). 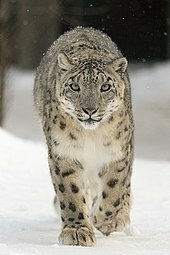 Snow Leopard Survival Strategy (PDF). Seattle, USA: International Snow Leopard Trust and Snow Leopard Network. ↑ Janecka, J. E.; Jackson, R.; Yuquang, Z.; Diqiang, L.; Munkhtsog, B.; Buckley-Beason, V.; Murphy, W. J. (2008). "Population Monitoring of Snow Leopards Using Noninvasive Genetics". Cat News. 48: 7–10. ↑ Kitchener, A. C.; Breitenmoser-Würsten, C.; Eizirik, E.; Gentry, A.; Werdelin, L.; Wilting, A.; Yamaguchi, N.; Abramov, A. V.; Christiansen, P.; Driscoll, C.; Duckworth, J. W.; Johnson, W.; Luo, S.-J. ; Meijaard, E.; O’Donoghue, P.; Sanderson, J.; Seymour, K.; Bruford, M.; Groves, C.; Hoffmann, M.; Nowell, K.; Timmons, Z.; Tobe, S. (2017). "A revised taxonomy of the Felidae: The final report of the Cat Classification Task Force of the IUCN Cat Specialist Group" (PDF). Cat News (Special Issue 11). ↑ Liddell, H. G. & R. Scott (1940). "πάνθηρ". A Greek-English Lexicon, revised and augmented. Oxford: Clarendon Press. ↑ Monier-Williams, M. (2005). A Sanskrit-English Dictionary: Etymologically and Philologically Arranged. Motilal Baransidas Publishers. ISBN 978-81-208-3105-6. ↑ Hemmer, H. (1972). "Uncia uncia" (PDF). Mammalian Species. 20 (20): 1–5. doi:10.2307/3503882. JSTOR 3503882. Archived from the original (PDF) on 2012-04-01. ↑ ୧୬.୦ ୧୬.୧ ୧୬.୨ ୧୬.୩ ୧୬.୪ ୧୬.୫ ୧୬.୬ ୧୬.୭ ୧୬.୮ Sunquist, M.; Sunquist, F. (2002). "Snow leopard". Wild Cats of the World. Chicago: University of Chicago Press. pp. 377–394. ISBN 0-226-77999-8. ↑ Boitani, L. (1984). Simon & Schuster's Guide to Mammals. Simon & Schuster, Touchstone Books. ISBN 978-0-671-42805-1. ↑ ୧୮.୦ ୧୮.୧ Chadwick, D. H. (2008). "Out of the Shadows". National Geographic. Retrieved 2010-01-29. ↑ ୧୯.୦ ୧୯.୧ Nowak, Ronald M. (1999). Walker's Mammals of the World. Johns Hopkins University Press. ISBN 0-8018-5789-9. ↑ Weissengruber, G. E.; Forstenpointner, G.; Peters, G.; Kübber-Heiss, A.; Fitch, W. T. (September 2002). 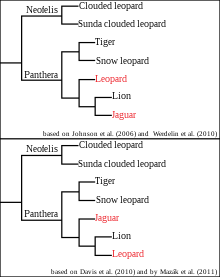 "Hyoid apparatus and pharynx in the lion (Panthera leo), jaguar (Panthera onca), tiger (Panthera tigris), cheetah (Acinonyx jubatus) and domestic cat (Felis silvestris f. catus)". Journal of Anatomy. 201 (3): 195–209. doi:10.1046/j.1469-7580.2002.00088.x. PMC 1570911. PMID 12363272. ↑ Jackson, R. (1998). "People-Wildlife Conflict Management in the Qomolangma Nature Preserve, Tibet" (PDF). In Wu Ning; D. Miller; Lhu Zhu; J. Springer. Tibet’s Biodiversity: Conservation and Management. Proceedings of a Conference, August 30 – September 4, 1998. Tibet Forestry Department and World Wide Fund for Nature. China Forestry Publishing House. pp. 40–46. ↑ Ming, M.; Snow Leopard Network (2005). Camera Trapping of Snow Leopards in the Muzat Valley. Retrieved 27 November 2006. ↑ "One Snow Leopard Needs a Protected Range Bigger Than Aruba". 21 September 2016. ↑ Macri, A. M. & E. Patterson-Kane (2011). "Behavioural analysis of solitary versus socially housed snow leopards (Panthera uncia), with the provision of simulated social contact". Applied Animal Behaviour Science. 130 (3–4): 115–123. doi:10.1016/j.applanim.2010.12.005.